SUBGINGIVAL MICROBIOTA IN SEVERE CHRONIC PERIODONTITIS. Christina Popova1 , Velitchka Dosseva-Panova1, Angelina Kisselova-Yaneva2, Vladimir E. Panov3. 3) Department of Conservative Dentistry and Oral Pathology, Faculty of Dental Medicine, Medical University, Varna, Bulgaria. Literature data relate certain Gram-negative anaerobe microorganisms with advanced destructive periodontal lesion. There are some references which reported higher levels of periodontal pathogens by the red and orange complex in deep periodontal pockets. The aim of this study is to determine the presence of most important periodontal pathogens and Candida spp. 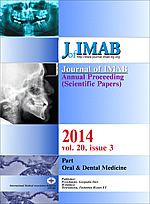 in deep periodontal pockets in patients with severe chronic periodontitis. The results of this study indicate the presence of high levels of periodontal pathogens in a strong connection with periodontal disease in deep periodontal pockets of patients studied. Popova Chr, Dosseva-Panova V, Kisselova-Yaneva A, Panov VE. Subgingival microbiota in severe chronic periodontitis. J of IMAB. 2014 Jul-Sep;20(3):554-557. 5. Quirynen M, Teughels W, Haake SK, Newman MG. Microbiology of periodontal diseases. In: Carranza FA, Newman MG, Takei HH, Klokkevold PR. Carranza’s Clinical Periodontology. 10th ed. Missouri: Saunders Elsevier, 2006; Chapter 9, p:134-169. 9. Jenkinson HF, Douglas LJ. Interactions between Candida Species and Bacteria in Mixed Infections. In: Brogden KA, Guthmiller JM, editors. Polymicrobial Diseases. Washington (DC): ASM Press; 2002. Chapter 18.